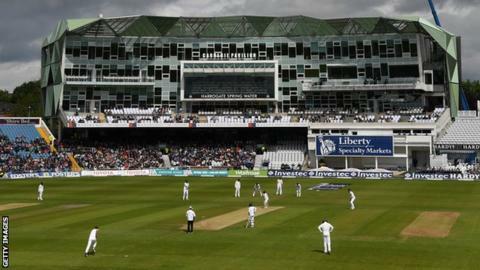 Yorkshire chief executive Mark Arthur has said it would be "sensible" for Headingley to host Tests in July. The club played host to the opening Test of the summer, where England beat Sri Lanka inside three days. "Headingley should be playing their Test match cricket in July," Arthur told BBC Radio Leeds. "The current regime at the ECB have inherited this situation and they agree with us that it is nonsense to have any Test matches in the north in May." Attendances grew as the game progressed, with a near sell-out on Friday followed by a full house on Saturday. However, there is a small turnaround between the Headingley match and the second Test, which begins at Durham on Friday. "It splits the crowd and the vagaries of the weather - sometimes you can get very good weather at this time of year," Arthur continued. "We're lobbying hard for when the new structure comes out post-2019 that Headingley goes back to a July slot. That would be sensible for all." Yorkshire will refund supporters who had tickets for the fourth day, but the club is insured by the ECB if it does not go to five days. "The worst situation for any Test match ground is if the game goes into the fifth day for an hour or so," Arthur added. "You have all the set-up costs and absolutely no revenue. Ideally you want a game to finish after tea on the fourth day."